Hundreds gathered to commemorate the lives of Indigenous women and girls who are missing or have been murdered in Canada. On the evening of Thursday, Oct. 4, Mohawk activist Ellen Gabriel addressed the crowd at Cabot Square by thanking them for their support on “this issue that has been plaguing Indigenous nations, families, women, children, since contact. 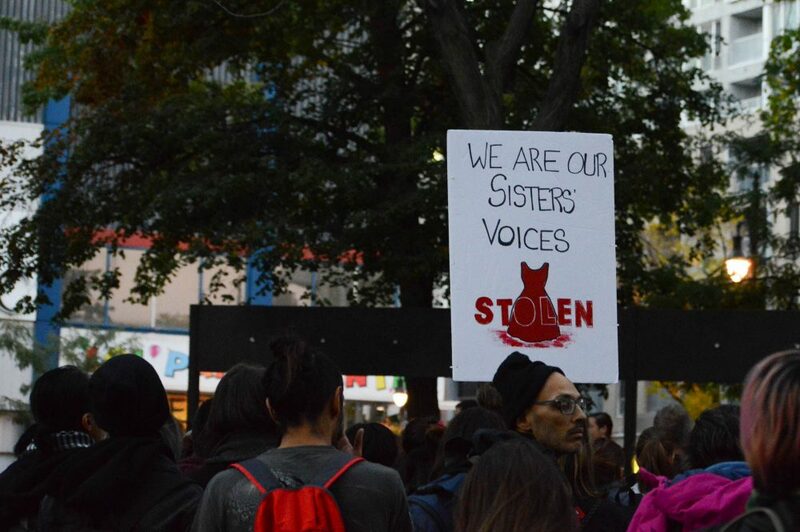 That’s how long it’s been.” The 13th annual vigil was organized by the Native Women’s Shelter of Montreal (NWSM) and Concordia’s Centre for Gender Advocacy. Jessica Quijano, a vigil organizer and project coordinator for the Iskweu Project at the NWSM, called for a greater awareness of the social crisis. Specifically, she is advocating for more “wet shelters”: places where homeless people can receive services even if they are intoxicated. She is frustrated that The Open Door shelter is relocating, as it served many people who frequent Cabot Square. Viviane Michel, president of Quebec Native Women, spoke about how there was no mention of murdered and missing Indigenous women in the recent provincial election debates. “It’s like we didn’t exist, it’s like we didn’t need protection, it’s like our women don’t need security,” she said. Her voice rose: “I am furious,” noting that the title of the event, “Love, Rage, and Solidarity,” was fitting. She said Canadians need to join together to mobilize and put pressure on the government. An RCMP report from 2014 found approximately 1,200 police-reported cases of Indigenous female homicides or Indigenous women still considered missing between 1980 and 2012. Canada’s former Minister of Status of Women, Patty Hajdu, said the numbers could be as high as 4,000, according to the CBC. After the speeches, attendees marched to Phillips Square, chanting, “Break the silence, end the violence,” and held candles to remember the women who have been lost. Joey David, a Mohawk man who attended the march, is frustrated by the lack of investigation into cases of missing and murdered Indigenous women. He is tired of them being profiled by police and came out to support his people.